This past week was an emotional roller coaster. My fiancee, James, and I had both of our families over for Thanksgiving dinner and announced our engagement. It was amazing. We were overjoyed to share our news with both of our families present, but our hearts were heavy in anticipation of what the next day would bring. 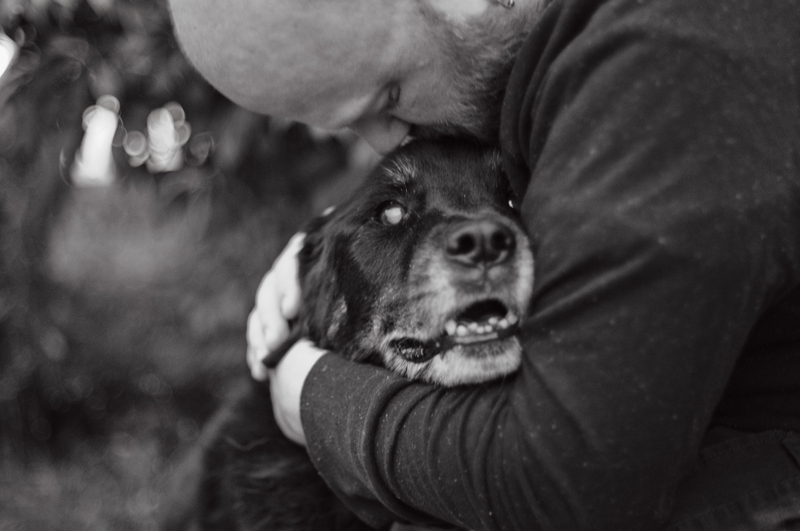 We were preparing to say goodbye to one of our beloved dogs, Delilah. Delilah was a 15 year old Rottweiler/Chow/Lab mix whose health had deteriorated over the past couple of months. She was unable to chew her food, and after countless attempts at getting her to eat all sorts of things, we had to make the decision to have her euthanized. We wanted to have her euthanized at home, and we wished to have her privately cremated. I couldn’t stand the thought of her being cremated and disposed of with other dogs. After researching the costs, we came to the realization that we just could not afford an at home euthanization and private cremation. We decided to have her euthanized at the clinic and to then bury her body in the backyard of James’ parents’ home. Early in the week we made an appointment for Friday and carried on with work and Thanksgiving preparations. On Wednesday, James went in to his work several hours before his shift to pick up his paycheck. While he was there, he was presented with a card that had been signed by each of his workmates, along with enough money to cover the costs of in-home euthanasia and a private cremation for Delilah. When he called to tell me what they had done, I immediately began weeping. I could not believe that they had given us such a gift. I’m not just talking about the money. To be given the gift of love and support during a time of such heartbreak is more precious than anything. I will forever be grateful to them for all of it. When I got home from work, I read each note in the card and wept until I couldn’t read anymore. I had to work for a few hours on Friday, but after I got home, we spent the afternoon with Delilah. We talked about some of our favorite memories of her, and we cried. We held eachother while looking at our favorite photographs of her. When the time came in the evening, we sat on the floor with her, stroked her ears, and whispered to her our goodbyes. A few minutes later, she was gone. When I got up yesterday morning, there was snow blanketing the neighborhood. I was so excited, I ran to the bedroom to tell James. He shot out of bed, and together we watched our two huskies play in the snow in the back yard. Last night, James told me that he feels so much closer to me after going through this loss together. I feel that way too. Last week I was scared of what was ahead of us. I didn’t know if I could handle all of the emotions I would be feeling, and the thought of seeing James so heartbroken absolutely terrified me. I know now that together we are so much stronger than we ever realized. I have Delilah to thank for that. We loved her so much, and in the end, she reminded us how much we love and need one another. Rest in peace sweet D.
If you live in, or are visiting, the Seattle area please head over to Burgundian for some food and drinks, and give the people who work there some love. They are the ones who made it possible for us to give Delilah the send off she deserved, and we are eternally grateful to them. Previous Post The Art of Gift Giving.